Hey, look at the clock- it’s time for your “social media is destroying the world” post of the day! Okay, it’s not really that bad- but it seems everywhere you look, Facebook and its ilk are being blamed for pre-existing societal problems. Before we even get started, I’ll say upfront that I am of the mindset that Facebook is the tool, but that few of these panics are actually anything started by Facebook, or Twitter, or Formspring. We had bullying, divorce, and people losing their jobs due to stupidity long before Facebook- Facebook just makes it something you can do from your smartphone. So Facebook is again at the other end of the blame-hammer, this time for precipitating about a third of divorces in Britain. The stats come from a website- the UK’s Divorce-Online, and cull stats from 5,000 divorce petitions. The same stats were pulled in 2009, and at that time, Facebook made an appearance in 20% of the petitions. 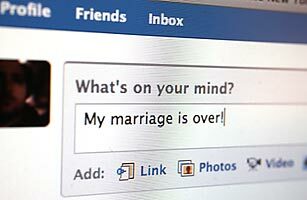 Infidelity-related complaints were a forerunner, along with using Facebook walls to make nasty comments about soon to be exes. Have you seen a relationship melt down on Facebook in real time?